Mobile usage and mobile content consumption have been hot topics the marketing and business world have been talking about in the last year. It all started in May 2015, when Google revealed that mobile searches overtake those performed on desktop and laptop computers in many countries, including the US and Japan. But we, as human beings, already knew that because we spend more and more time with our smartphone, randomly browsing through links, watching funny videos, and reading the news. These and other behaviors have all a common background: we rely on and use smartphones a lot. And smart companies know that too. That's why, roughly in the past year, some of the greatest ones have been working on new technologies and ways to let us engage with content even more through our mobile phones. Facebook with Instant Articles, Google with Accelerated Mobile Pages and Apple with Apple News, these are they new kids in town. So what's this all about?, How can I enable them on my WordPress website? and Will they be useful to my business in any way? On April 12th, during their Facebook's F8 conference, Zuckerberg opened up Instant Articles to all interested publishers (after a 1-year period with selected beta testers) and now many businesses around the world are trying to understand what these Facebook Instant Articles are up to, how can they be implemented, and so on. Let's dig into the topic, shall we? "Instant Articles is a mobile publishing format that enables news publishers to distribute articles to Facebook's app that load and display as much as ten times faster than the standard mobile web". In other words, Facebook is leveraging an HTML5 markup format optimized for the mobile experience that will result in 3 main differences when compared to the standard article format: content will load faster, it will be rendered differently from the original source and content consumption will happen within the Facebook app. Let's look at them a little closer and try to understand why Facebook is doing this. With the goal of increasing the time people spend on Facebook, backed-up by the high and continuously growing volume of mobile users around the world, Instant Articles provide mobile users with a faster uploading time of those pages that feature the correct markup. Result: the faster your link uploads, the more links you're likely to visit. With that goal in mind, Facebook also needed a new way to display articles and pages while lowering the time required to display that given page. Result: Instant Articles render content in a different way from the original source. But that's not all of course. Here are some other elements that pertain to Facebook Instant Articles. How Instant Articles are different from standard articles/updates? Now that Instant Articles are open to any interested publisher (like you and your business), it might be useful to know how to get started publishing them via your beloved CMS WordPress. It's important here to understand that, even if almost anybody is able to enroll in the program, you're required to create and submit a group of 10 articles (before they required 50) to be reviewed and approved by Facebook before publication can begin. Claim your URL. Once you select your Facebook Page, you'll be asked to designate a URL you'd like to use for publishing your articles. You have three choices to determine which stories will be eligible for publication as Instant Articles: via a root domain, via a subdomain or a specific path within a domain. Create articles. You can sync your blog with Instant Articles via Facebook's publishing tools, an RSS feed or by using an API. The most effective way to automatically implement and manage Facebook Instant Articles on your WordPress website is via a new RSS feed that will tell Facebook your articles are correctly formatted in no time. Specifically, you'd need to create a new RSS feed in the form of /?feed=instant-articles or /feed/instant-articles, depending on your permalink settings, that Facebook can pull information from. As with many other case scenarios within the WordPress world, plugins are often the very first resource many end up to. And even this time it'll be ok, but just bear in mind and understand that Facebook Instant Articles are a "new thing" and all the plugins currently available have issues, some of which are huge and can prevent you from effectively set up your WordPress website to properly format your article for your Facebook page. For example, some days ago there were still users experiencing a fatal PHP error message after installing and activating the most referenced plugin for Facebook Instant Articles, the one from Automattic, available via GitHub. My work here is not pointing out some sort of plugin fails; it's quite the opposite. Thus, my suggestion is to acknowledge how close to Facebook's opening up Instant Articles to everybody we still are, and understand that it's still early to get a ready-made, off the shelf solution to perfectly create Facebook Instant Articles through WordPress. This means you should test at least two of the several plugins today available and play with them to see which one is best fit for you. What about the traffic that Facebook Instant Articles generate? How can I track users visiting my Instant Articles? Since everything happens within the Facebook app, you might wonder how you could track those hits on your Facebook Instant Articles and have it grouped in your Google Analytics account. As we know for sure, thanks to their official documentation, tracking data is doable: "Facebook Instant Articles is compatible with industry-standard content analytics tools, including Google Analytics and comScore attribution". The question is: "how can I track those data with my Google Analytics account?" This code snippet is a compound created by adding Facebook's suggestion together with the Google Analytics script by neoplomero. During the 1-year closed beta testing phase, Facebook gathered some interesting data around Instant Articles that has later disclosed. Specifically, Instant Articles received 20%+ clicks than mobile web articles from the News Feed, they tend to be shared 30%+ and users are 70% less inclined to abandon the instant article before reading than mobile web articles on average. These data might lead you to think of Facebook Instant Articles as the next big thing and, for every second you spend not implementing this new format, your business is missing out on something. But it's not completely true because Facebook Instant Articles aren't a good fit for every business out there. Many keeps saying that Instant Articles are primarily targeted to those who regularly put out fresh content on a daily basis, like newspapers for example. Even if I do see the uploading speed of articles, a more engaging and immersive article format as features that might work for such publishers, they're all giving away some assets they previously could grow their brand on and even monetize, i.e. their community (Instant Articles don't allow comments). Would your business benefit from giving up such assets? There's only one person who can answer this question: you. Back to you now: have you tried Facebook Instant Articles yet? How things are doing with that? 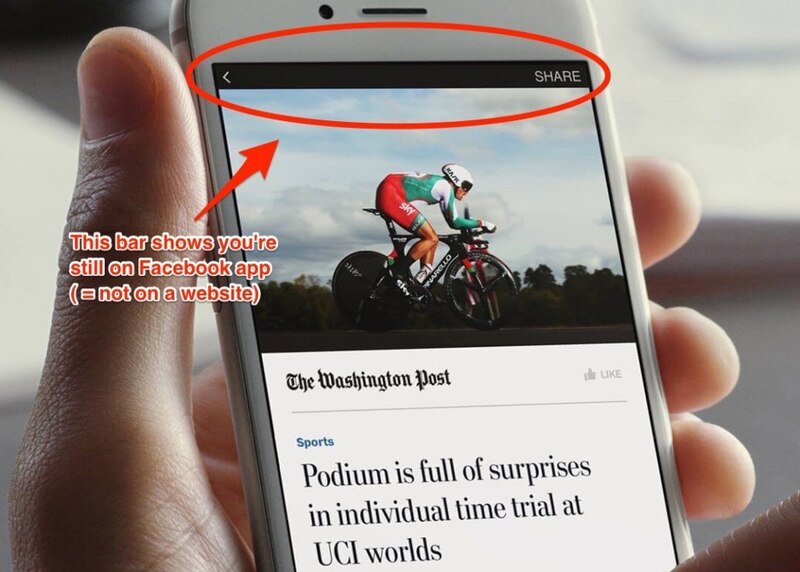 Do think Facebook Instant Articles will be a key element to your business' online strategy? I’ve also installed the PageFrog plugin. After review and approval of my articles by Facebook, I hope to start publishing instant articles. Shouldn’t that Analytics code be wrapped in tags? Hi , you can get sample instant articles samples on facebook and try to edit. Very useful article. However, I have question. How would you track visits from clicks on Related Articles suggestions, which are not instant articles. I have noticed, that once person clicks on non-IA Related Articles and gets redirected to website, traffic source is indicated as m.facebook.com/referral. How can I grab the current post title? to replace the variables – POST TITLE? I have written a post about enabling Facebook Instant Articles for Blogger hosted websites. I put a lot of efforts behind it. Please check the link and give me feedback. And if you find it useful, can you consider inserting the link anywhere inside the post? Thanks.